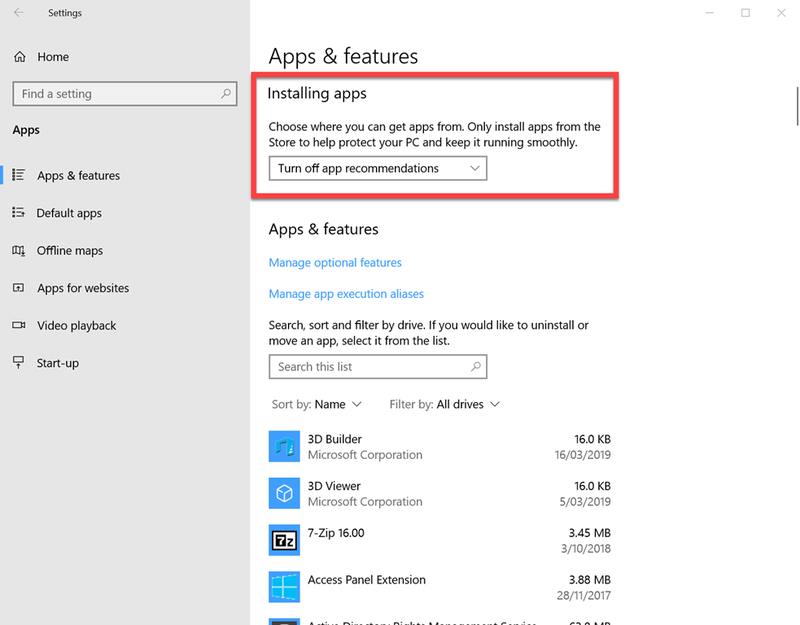 If you go into your settings in Windows 10 and select Apps you should see the above dialog. You can see the options that are available to you as shown above. 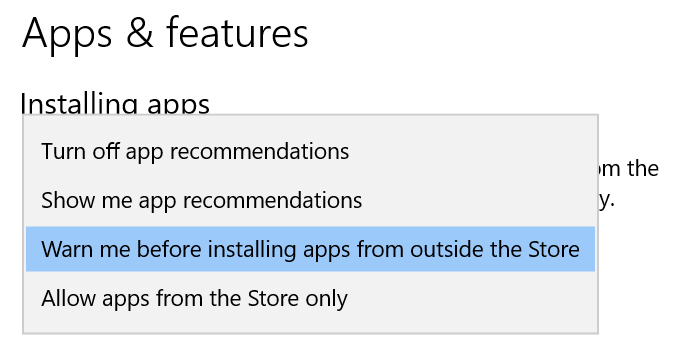 You’ll see that one of the options available is Allow apps from Store only. Although not a fool-proof security option but setting this would reduce the chances of malware executing on the desktop because the only method of installation is from the Microsoft curated Store. A random piece of malware, delivered via email say, could not execute since it doesn’t come from the Microsoft Store I would suggest. 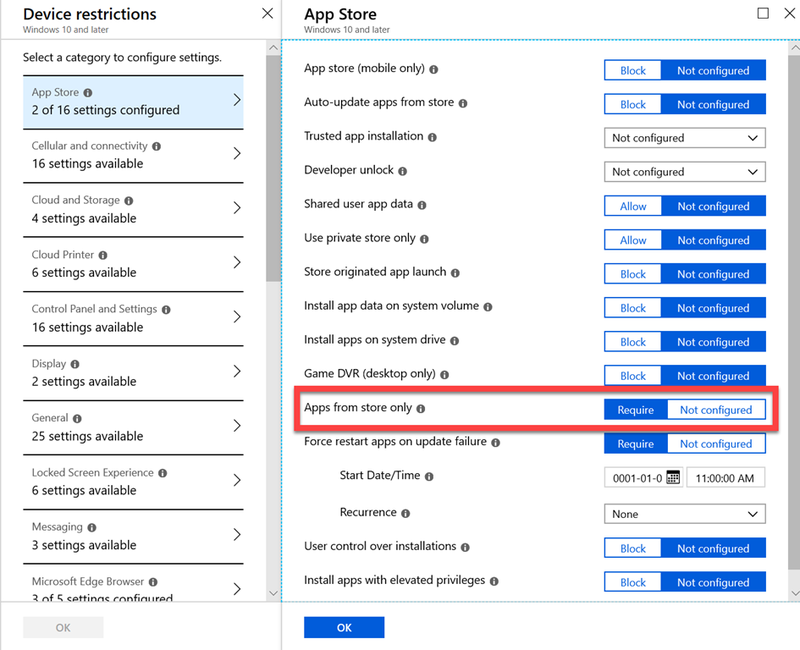 Using Intune we can apply this setting across a range of Windows 10 desktops using a Windows 10 Device Restriction Policy as you see above. Simply locate the App Store option, then Apps from store only and set the value to Require as shown. In a short period of time, once the policy has deployed, those devices will only be able to install software from the Microsoft Store, preventing installation from anywhere else and hopefully also preventing malware installations. The good thing about this restriction is the user can still be a local administrator of their machine if you desire and installations will be restricted. The other good things is that it is policy based, which means it is easy to turn on and off as required or exclude users if need be. As I said earlier, it is not a fool proof method of preventing malware being installed on a Windows 10 desktop, but would certainly make it much more difficult. In this day and age, we need all the help we can get to counter the threats. Hopefully, this will help.